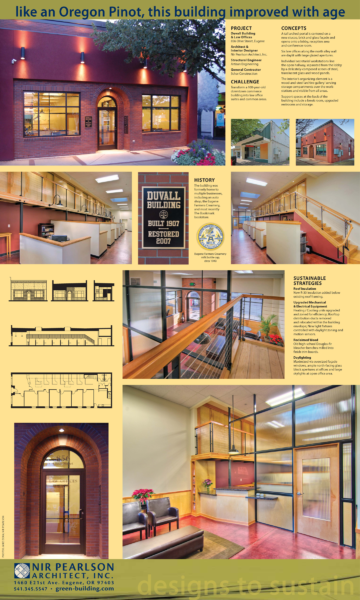 Transform a 100-year-old downtown commerce building into law office suites and common areas. A tall arched portal is centered on a new stucco, brick and glass façade and opens onto a lobby, reception area and conference room. Six law offices along the north alley wall are daylit with large glazed apertures. Individual secretarial workstations line the open hallway, separated from the lobby by a delicately-composed screen of steel, translucent glass and wood panels. The interior’s organizing element is a wood-and-steel ‘archive gallery’ serving storage compartments over the workstations and visible from all areas. Support spaces at the back of the building include a break room, upgraded restrooms and storage. The building was formerly home to multiple businesses, including an auto shop, the Eugene Farmers Creamery, and most recently The Bookmark bookstore. Roof Insulation: New R-30 insulation added below existing roof framing. Upgraded Mechanical and Electrical Equipment: Heating / Cooling units upgraded and zoned for efficiency; Rooftop distribution ducts removed and relocated within the building envelope; New light fixtures controlled with daylight zoning and motion-sensors. Reclaimed Wood: Old high-school Douglas-fir bleacher benches milled into finish trim boards. Daylighting: Maximized via oversized façade windows, ample north-facing glass block apertures at offices and large skylights at open office area. Posted in Awards, Commercial, Regional.